The Willamette Falls Legacy Project was extremely honored to have members of the Confederated Tribes of Grand Ronde and Confederated Tribes of the Umatilla Indian Reservation join us June 3 when we unveiled the design concept for a future riverwalk. The project has diligently been reaching out to and coordinating with these tribes since 2013, along with Confederated Tribes of Siletz Indians, Confederated Tribes of Warm Springs, and Confederation Tribes and Bands of Yakama Nation. Engagement with Native American tribes is different from the engagement that public agencies conduct with local communities and neighborhoods that many of us are accustomed to. Tribal governments are independent sovereign entities that have treaties with the federal government. Many of these treaties, like the 1855 Walla Walla Treaty, required Native Americans to surrender much of their land, while retaining the legal rights of tribal members to hunt and fish in their usual areas, both inside and outside of reservation land. 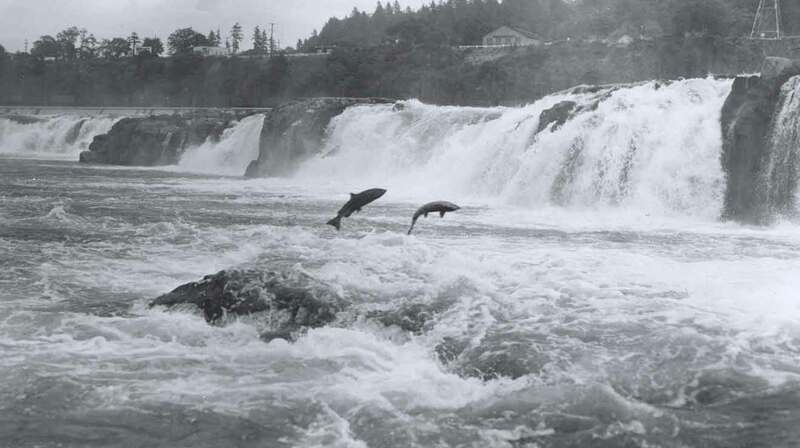 These treaties are relevant to this project because Willamette Falls is a place where Native Americans fished and gathered both historically and still do today, in accordance with their treaty rights. For us, it is important to understand the painful history of Native American tribes in the Pacific Northwest and throughout the country. This history has had lasting legacies and continues to shape the way we interact today. Past government actions have greatly harmed tribal communities, and that history is not easily forgotten or forgiven. Considering our past helps us to understand why building trust between tribes and government agencies, such as the Willamette Falls Legacy Project partners, takes time. As Armand Minthorn, Member of the Board of Trustees for Umatilla, said at the riverwalk event on June 3rd, we need to truly listen, and we must be open to change. We could not agree more. There are state and federal legal requirements for government-to-government consultation with tribes when public projects may have an impact on historic and cultural resources. These requirements (known as the Section 106 process), are triggered when an agency submits permit applications for projects, and will be met by the Willamette Falls Legacy Project when the permitting process for the riverwalk begins later this year. The Willamette Falls Legacy Project is going beyond the minimum legal requirements for consultation with tribes. We began tribal engagement well before the riverwalk permitting process, recognizing our ethical obligation to reflect and honor the tribes’ history — and the opportunity to create a more meaningful public space. The project’s efforts were highlighted earlier this year in an article about the Tribal Advisory Board. Another way that the tribes have been engaged early is by contributing to the cultural landscape study: a compilation of the full site history based on thousands of historical documents and photos. The study has been informed by numerous meetings with tribes, and was shared in early draft form with the tribes last fall for in-depth review. We have cited many tribal resources and books in the draft report based on the feedback we received. We have also improved the report by highlighting the continued presence of tribal people at the falls. Native American tribes are not just a piece of history – they have been here and are still here, despite the actions of past individuals and governments to take away their land, culture and resources. The cultural landscape report and the resulting historic and cultural interpretation for the riverwalk will be more robust, more accurate and more powerful due to the time that tribal members and tribal staff have spent to help formulate it. As the project moves forward, a great deal of effort is being put in to engagement with the tribes that we have not been as successful in reaching, along with the tribes with which we have already been working closely. In addition to meeting our legal obligations through the federal Section 106 consultation process, we fully intend to continue our work with the Tribal Advisory Board, form agreements with the tribal governments regarding management and operations of the riverwalk, and work together to develop interpretive elements for the riverwalk that respectfully convey the tribal connections to the site. We at the Willamette Falls Legacy Project have learned a lot about tribal values and what is important to each tribe – and, we are still learning about each of the tribes with ties to Willamette Falls. The cultures of these tribes are very different from western culture. As non-tribal members, it has been revealing, and uncomfortable at times to face our history. We can never make up for the wrongs of the past. But we can do our best now to be inclusive, open and honest. And most important, we can listen. When the River Ran Wild! Indian Traditions on the Mid-Columbia and the Warm Springs Reservation by George W. Aguilar Sr.